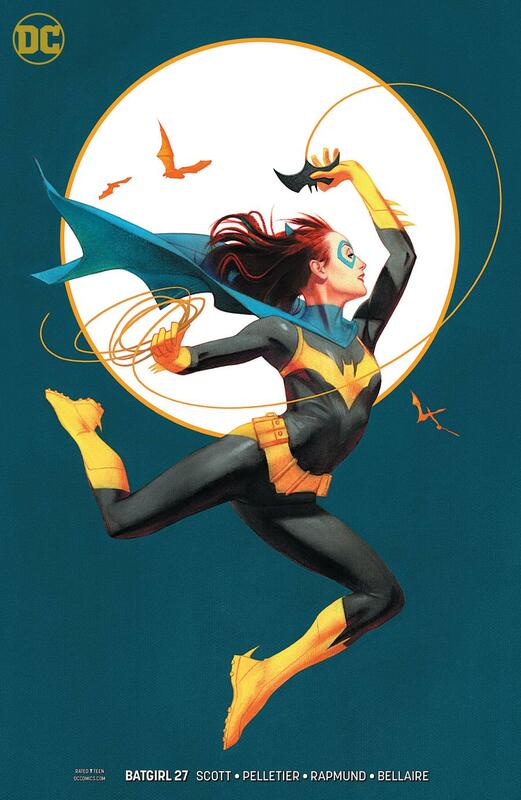 Last week we saw another Middleton Batgirl Killer B cover. All those Boba Fett fans came out from under their Tatooine rocks to nab the Galactic Icons cover to drive up the prices. We saw the hit show Stranger Things bring forth the unknown story of Will when he enters the Upside Down and a #0 Spider-Geddon book, since it’s just so hard to start with just a #1. I’m going to try and stick with the more prominent books from the past week. If a book isn’t mentioned, it’s likely still available for cover at most online and local shop retailers. Batgirl #27 Middleton is mostly a cover price book at the moment but a few sales peaked up around the $7-$8 range. So there’s hope with this one as I’m sure most retailers are catching on just to order these books as they do sell well, Middleton has his followers now. If a retailer still isn’t buying these Middleton Killer B books, I can only imagine they’re living in the dark ages and I’m unsure how they’re still in business or how they’ve even stayed in business. You can still find this one at Midtown and other retailers. It’s limited to just 1 copy at Midtown. Heroes In Crisis #1 from Tom King saw some deaths. As Anthony stated, piles of bodies. Not that significant if you ask me, heroes die all the time, it’s just a marketing and sales technique that needs to die itself if you ask me. What we want are surprise first appearances of cool characters, that’s where the real spec is at and the long term value. 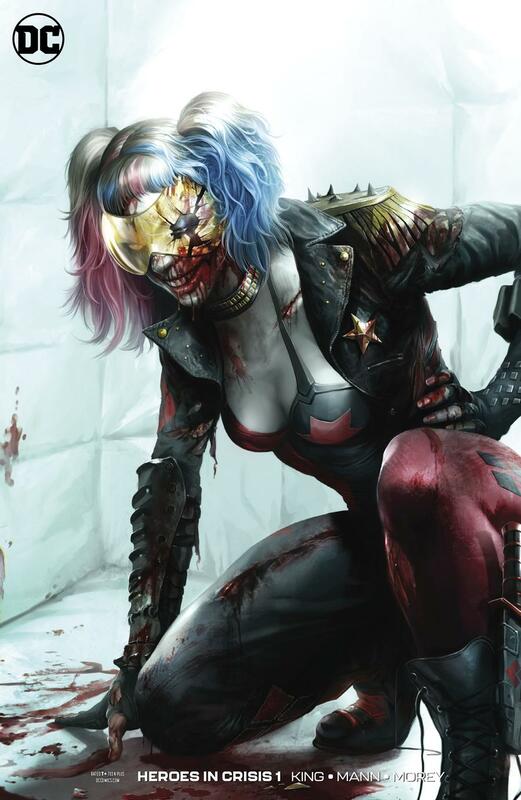 I will say the Mattina Variant cover with Harley Quinn is doing pretty decent on sales but not near the retailers price tag. Midtown listed their copies at $255 after their 15% discount and it seems most copies are selling around the $200 range. So unless you found this for cover price or cheap, you’re likely not making any money yet on these. Wonder Woman #55 Frison Variant was another mention but it’s still available at most online retailers at time of writing. Don’t let these fool you as these seem to go up over time, more of the long term gamble. I wasn’t particularly fond of this cover though, the red eyes just kind of look off to me. I usually like Frison’s artwork but I must say, the way she portrays the eyes kind of bugs me on some of her art. Edge of Spider-Geddon #4 is sold out at most online shops and it’s currently around a solid $5-$7 book on most recent sold listings, the Cully Hamner is the better seller of the two. Not bad but not great either. For some who might of got it for under cover with pre-sale discounts would benefit flipping these but for most, it’s not worth the time or effort if bought at cover price. If you grabbed a copy, just hold for the possible long term spec if the new Spider character ever takes off. 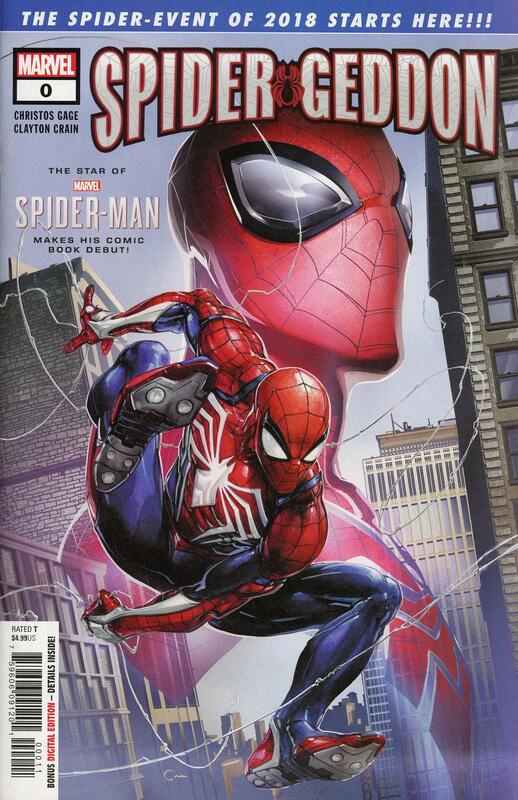 Spider-Geddon #0 Clayton Crain cover is sold out at most online retailers I’ve skimmed over and there are actual sales on the secondary market for a buck or two above cover but you can find almost all of the variants at Midtown still. It’s no surprise the Clayton Crain cover is selling better than the others, it’s the better of them all. 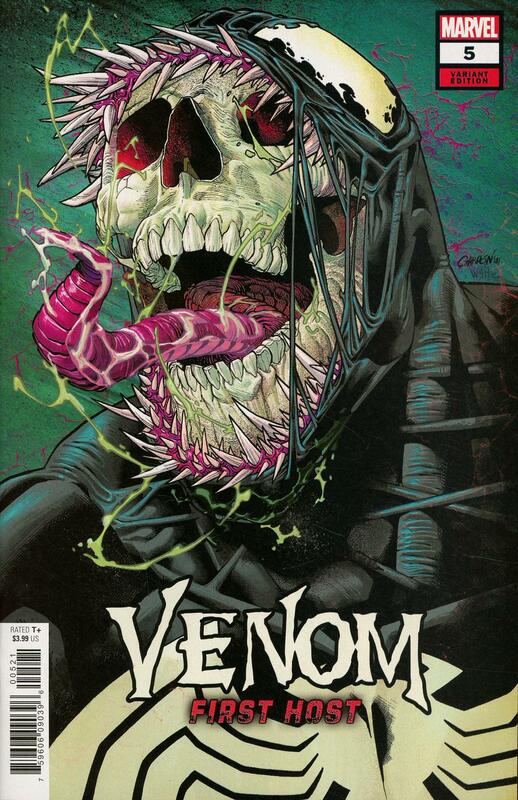 Venom First Host #5 regular cover is surprisingly a $10 on average book at time of writing (I bet you guys are tired of reading that right, it’s just I piece together these when I have time on different days of the week up until it’s published). I didn’t jump on the Venom First Host bandwagon but I must say, I understand why this one might be hotter than expected. It is a sweet looking cover by Javier Garron . I’m not that familiar with most of Garron’s work but if he keeps turning out covers like this one, we might have a new underrated cover artist on our hands. Garron will be at NYCC 2018 so maybe I need to find me a few copies to get signed while at the convention. 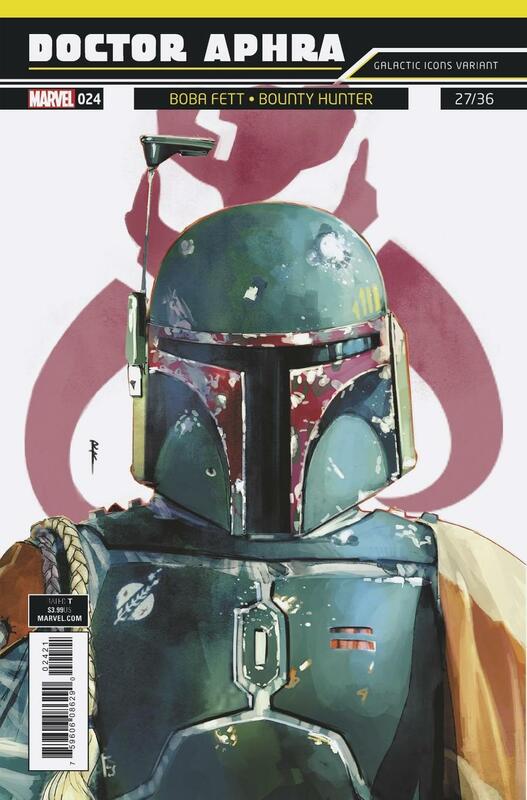 The real winner for Marvel this week is by far Doctor Aphra #24 Galactic Icons Boba Fett cover. This is a solid $12 to $20 book. Prices kind of all over the place but I’d say it’s on average being $15. This one might cool down some but since Star Wars has it’s fans, past present and future, this one will always be a winner more than likely as there are potentially new Boba Fett fans born daily. If you see a copy out in the wild, Poyo says nab it even if you aren’t a fan. Friendo #1 – Few sales around the $7 range on average. Seems some sets are selling between $10-$15 and then single issues have fetched $10 on their own. Covers B and C are certainly the top sellers from this series. Rolled & Told #1 – A few sales at $7, only two listings currently with one having $7 shipping on a BIN of $3.20. Unless this catches more heat, I would only speculate that this book won’t do much else from this point on. That’s your week in review. See those attending NYCC 2018 tomorrow at the convention. Find me and say hi, I’ll literally be wearing my Secret Agent Poyo label pin and I’ll be hanging around that dude named Anthony. Solid write-up AP—have a grand time in NY! So far so good. I walked around 10-12 miles today exploring Central Park and went and gazed at actual art masterpieces at the MET. Legs are tired but man, I love days where I have no real agenda. Those are some great days to enjoy! Glad you’re taking the opportunity to check out NYC. Great city is time of year. Weather is still nice and e leaves may start changing in Central Park, football and baseball usually have the city abuzz. Great little places to eat everywhere. Maybe it’s too late now, but try to get down to Wall Street and the Trade Center memorial, even if it’s just to walk through the park and see the reflection pools. I think we have plans to see the WTC Memorial one night already. I just realized I forgot to check Midtown today for Venom First Host #5 copies so I can get a few signed at the Con. Ughh..
Hope you guys have fun at the con. Good write up and analysis..do you believe the Boba Fett is more of a long term hold or flip now if you have copies? I’d say if you have multiple copies, sell some now, hold a few for long term as well. If you can make enough that pays for all of the copies you obtained and or nets you profit, any leftover is just icing on the cake. Previous Previous post: Quick Spoilers: Asgardians of the Galaxy #2 Death of a Hero?